A. Converting the light into the spectrum. Each of those technical tasks has the influence on the whole process, The quality of the whole process depends from the weakest member in the chain. I'll try to describe the each part with the technical approach. As in every technical design, some trade-offs must be made. The most important trade off concerns the size of input hole (the slit diapragm). Axis (X or Y) Depending from the construction of the spectroscope, we get the spectrum along the x or y axis of the camera sensor. 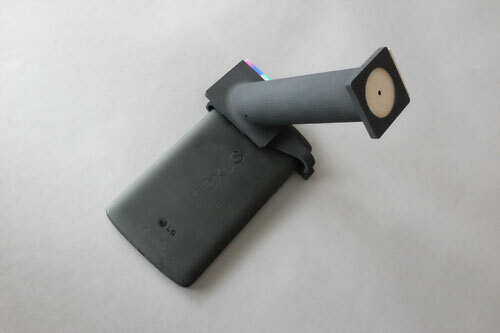 The sample spectroscope build for Nexus 5, provides the spectrum in Y axis. Direction (from left to right, or reverse) Both directions, from minus to plus and reverse are possible. B.1. Defining Axis, X or Y . With the mounted spectroscope, observe the spectrum of the whichever light. Identify the position of blue and red part of spectrum. When both parts of spectrum lay on the longer camera axis, we have X axis orientation, if they lay on the shorter camera axis we have Y axis orientation. Respectively we should set the spectrum orientation in preferences of Aspectra-Mini. The intensity of the plot, in the plot-fragment, should match or correspond to the brightness of the picture. F.I. If the picture on the left is dark, then the intensity shown in plot should be small on the left too. (Leave the mirror setting Off). If intensity on the plot is dark on the right, then set the mirroring in preferences On. From the whole picture, the area of interest will be read the in YUV format. We can define two axis for our AreaOfInterest: X (length) and Y (width). Based on our settings in CameraPreviewView, we have defined four points: Xend, Xstart and Ystart and Yend = Ystart + Ywidth. Important notice: the X axis dimension is in pixels. The spectrum plot, shown in App-plot-area, shows the intensity of light as the function of the camera pixel's index. To get the plot results as the function of lambda (light wave length) the the whole system need to be calibrated. The are some conditions, which must be fulfilled, to allow calibration. The main condition is the stable montage of spectroscope with light sensor. 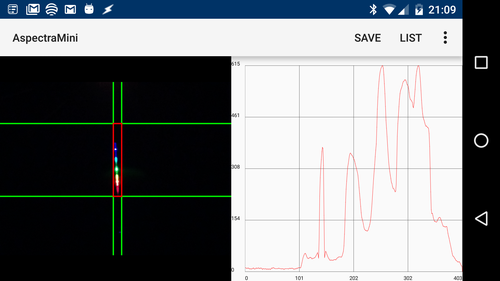 The actual version of spectroscope (as shown for Nexus 5) doesn't allow stable build. It is a new version of spectroscope in preparation, which allows both: the stable and universal montage on the most of the Android devices. In the calibration phase, the color LEDs will be placed near the input of spectroscope. On Android device, the color bar can be moved and stretched below the plot area. The color bar will hold the lambda markers for every LED. In the measurement phase, the color bar will be shown near the plot, as the orientation for observed results.